How Do Seniors Apply for Medicare? Medicare is the government-approved program that provides health insurance to older Americans. Rhode Island elder care providers or family caregivers can help seniors apply for coverage online at the Social Security website. The process requires less than 10 minutes and does not require a signature. Otherwise, qualifying candidates will receive notification in the mail. Individuals who are U.S. citizens or legal residents must be aged 65 or older or be under 65 and have a diagnosed disability to apply for Medicare benefits. Individuals having end stage renal disease or HIV/AIDS are also eligible for Medicare. Birth country if born outside of the U.S.
Medicare offers four coverage plans for different types of services. If individuals or their spouses paid Medicare taxes while employed, Part A coverage is premium free. Otherwise, the fee is $411 monthly. The coverage is also premium-free if the senior receives Social Security or Railroad Retirement Board benefits. The cost of coverage for Medicare Part B is based on past income. Premiums begin at $121.80 per month for anyone having an income of $85,000 or less. The amount is automatically deducted from Social Security or Railroad Retirement Board benefits. Premiums for Medicare Part D vary with the type of policy acquired, the type of medications used, whether the medications qualify for coverage and whether the pharmacy used is covered by the plan. 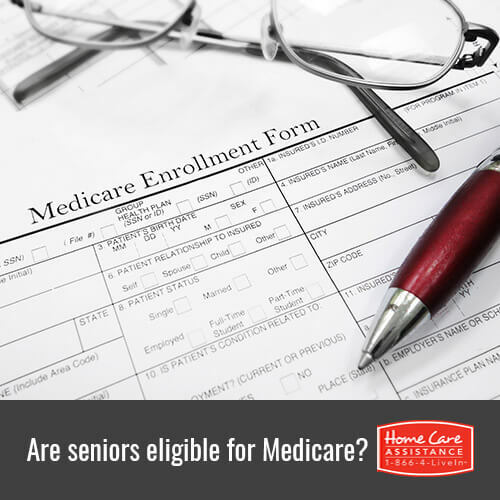 Seniors having limited income or resources may be eligible for state assistance with Medicare Part A, B and D premiums. While Medicare does not cover non-medical home care, there are alternative means your loved one can use to hire Home Care Assistance of Rhode Island. We provide comprehensive live-in, hourly, and respite home care in Rhode Island that helps seniors manage daily tasks by offering medication reminders, meal preparation assistance, housekeeping, and more. Learn how Home Care Assistance can boost your loved one’s physical and emotional wellbeing by calling (401) 284-0979 to schedule a free consultation today.